Your little builder will have a great time with this Giant Construction Floor Puzzle. 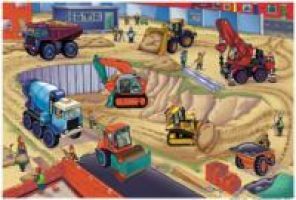 It shows a cool construction zone with all kinds of activities going on - dump trucks, bulldozers, cement mixers, and more! The 30 large pieces are perfect for small hands, and 8 of them are specially shaped cutouts of the construction vehicles! This giant puzzle is sized for floor fun at 24" by 36"